Guests can choose from 58 one-of-a-kind guestrooms that are as eclectic as they are comfortable. Each room is a private sanctuary that is relaxing yet invigorating, with plush, thoughtful amenities that are simultaneously eco-conscious. Start the day with a delectable artisanal-style breakfast and end it with a glass of wine with friends at the bar. Guests will find the perfect mix of funky and fancy in this unique retreat, with amenities such as complimentary WiFi, a 24-hour fitness center, and business center. Situated in the heart of Syracuse University and the historic University Hill neighborhood, Hotel Skyler is a stone’s throw from Golisano Children’s Hospital, Upstate Medical, and SUNY ESF. Shrink your carbon footprint by walking to nearby shops and eateries, or by taking advantage of easy access to public transportation along Syracuse’s community connectivity corridor. The hotel is also just a few minutes away from the Carrier Dome, the OnCenter, local theaters and concert venues, and the Carousel Shopping Center, as well as Armory, Hanover, and Clinton Squares. 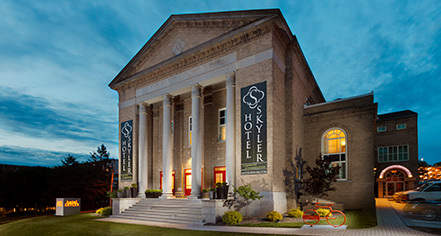 Hotel Skyler Syracuse, Tapestry Collection by Hilton, a member of Historic Hotels of America since 2018, dates back to 1921. 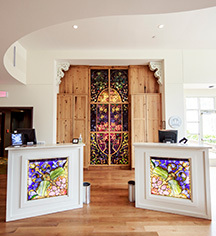 Hotel Skyler is Syracuse's first LEED Platinum certified hotel and the first to join Hilton's new upscale brand, Tapestry Collection by Hilton. The lobby of Hotel Skyler Syracuse, Tapestry Collection by Hilton greets guests with industrial minimalism and soothing organic touches. Built in 1921, it was occupied by the Temple Adath Yeshurun for approximately 55 years. Subsequently, the building was owned by the City of Syracuse and housed the Salt City Theatre Group. Learn more about the History of Hotel Skyler Syracuse, Tapestry Collection by Hilton .